Make a healthier version of your favorite take-out with this Asian edamame fried rice! I’m a sucker for Chinese fried rice, but who knows how much oil is added when you order it out. Making it yourself is healthier and easy to do. This dish pairs perfectly as a side dish with some favorites like Asian Turkey Meatballs, Asian Drumsticks, Asian Grilled Chicken. For this healthy version of fried rice I used leftover brown rice, edamame, carrots, scallions and onions. The beauty about making it yourself is you can add anything you want. If you want to make this a main dish you can add a protein such as chicken, shrimp or even tofu to keep it vegetarian. If you don’t have leftover rice or want to take the time to make it, I LOVE Trader Joe’s frozen (unseasoned) brown rice. It comes in a box with 3 packets (2 cups each) of par-cooked rice. It’s ready in 3 minutes and is perfect every time. Edamame, in case you’re not familiar with them are green soybean sold shelled or in the pod in most supermarkets both frozen or ready-to-eat – my two year is crazy about them! I like to buy the shelled ready-to-eat for convenience. Whisk eggs and egg whites, season with salt and pepper. 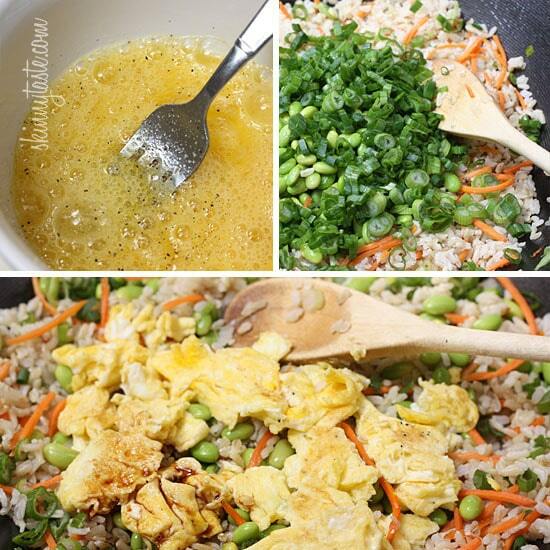 In a hot wok, spray a little oil and cook the eggs. When cooked, remove from pan and set aside. Let the wok get really hot. Add oil and cook onions, scallion whites, carrots and garlic for about 30-60 seconds, careful not to burn. Add brown rice and stir well a few minutes to heat through. Add cooked egg along with soy sauce, scallion greens and edamame, mixing well for about 3-4 minutes. This is a delicious meal. My boyfriend and I make it all the time. We also add shrimp or chicken. Very, very good THANK YOU!!!!! 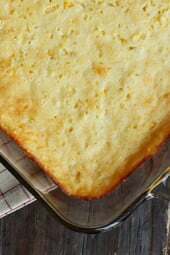 This recipe is very easy and tastes great! I'm thinking next time I may add chicken or shrimp. Made this for lunch today without the edamame (I didn't have any on hand) and subbed in frozen peas, green beans, and corn. I also added a handful of mung bean sprouts and it was super delicious! Hi! 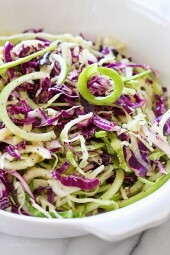 I want to make a big batch of this for lunches. How many days do you think it would last, cooked, in the fridge?? This was great! Didn't like edamame the first time I tried it, but totally did not mind it in this dish. I need to double this the next time I make it. It didn't last at all in our home. Just made this last night, YUM-O! 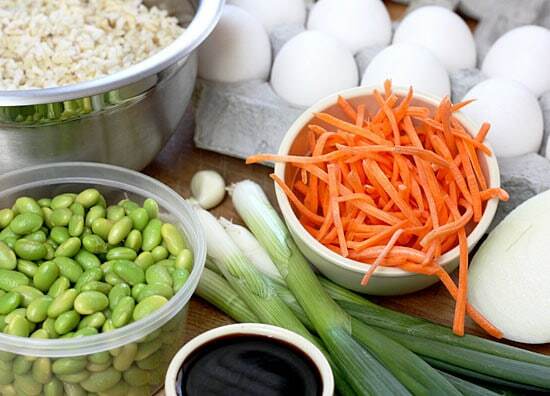 Where do you find edaname in the grocery store? Although im am not new to your wonderful blog, this recipe encouraged me to write my first comment. Made this for the first time last night, and as new proletarians (veg + seafood),my boyfriend an I are trying to stay creative and healthy with our meals. To add some protein and make this a main dish, I added a frozen salmon burger. I just broke it up into pieces as i was cooking the onion/carrot mixture and it turned out beautifully. I shouldn't be surprised though, every recipe I've tried from your site has been great! It looks good! I plans on making this for dinner tonight, would dry roasted edamame work ok? I would have to peel the skin off and boil it? Or would it start to soften when I cook it all in? Made this for the 1st time and it was delicious. I am not a huge scallion fan so I left those out but added some broccli and mushrooms to the mix to give it more veggies. I also added shrimp to make it a complete meal. It was sooo good. Thanks also for including the brown rice recipe. I usually make instant in the microwave and this may be the best brown rice ever. Not sticky at all, so good. I have been wanting to make this for ages – and tonight was finally the night. I made it with quinoa in a regular pan (I couldn't find my wok) and it came out great! We had it alongside chicken lettuce wraps. DeeeeeLISH! Thank you so much for all the wonderful recipes, Gina. 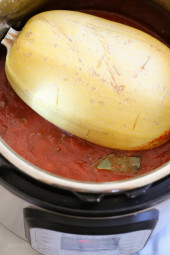 Thank you for the great recipe – my husband ate all the leftovers before I could put it away! Success! Clean, healthy and delicious looking. I'm going to try this with half brown rice and half cooked quinoa for an added boost of protein! I am crazy fro this recipe. I made it about 5 months ago for the first time with chicken and my taste buds thanked me. Since then I have made it with shrimp and pork. It's become a bit of a problem for me. I actually crave this and my sweet husband never complains when your skinny fried rice is yet again gracing his plate at supper! This was one of my first Skinnytaste recipes I ever tried. I LOVE your recipes. I've made several of them and love them all. Thank you for making cooking healthy easy and tasty! I added Schiracha and substituted the oil for sesame oil, which added a ton of value but you don't need to use a lot since they're both very strong. My hot wife made this tonight for dinner. Holy cow…it was awesome! This was so easy and delicious, it was hard to exercise portion control! I served it with grilled bangin' good shrimp. I was a star in my own kitchen. This blog has helped us eat so much better, in more ways than calories. I made this last night with quinoa instead of rice and it was SO GOOD thatI kept eating it out of the pan before dinner was served! I served it with the Asian Meatballs from here and my bf said it was the best Skinnytaste recipe yet and I must agree! I made this tonight and it was delicious. I used a pan instead of a wok, and it turned out great. I also used a small amount of toasted sesame oil to add a little flavor. I look forward to trying this again soon with chicken or shrimp. Thanks for the tasty and easy recipe! I have made this twice, once with Hoisin Sauce for a different spin and once with Sriracha for a spicy spin, both were really good. This was so good! I made it tonight and it was totally delish! I don't have a wok – can this be done in a fry pan? I made this as a side for the Asian Flank Steak Skewers! Perfect pairing! It was easy to make, so I'll def. be making this one again! This was so yummy!! Thanks for the great Chinese recipe to help with my unhealthy cravings!! Could you freeze this rice? I made this with Quinoa instead of rice and it was amazing!!! Thank you for the recipe!!! I dont have any smart balance oil, what would be a good alternative? Would EVOO work? Thanks!! This was so delicious! I added shrimp to mine and it was awesome. I will definitely be making this again! Made this today along with the Asian mango slaw and bangin shrimp skewers. So so so so GOOD. First time making fried rice. First time using edamame. It was delicious. Everyone had seconds. There was none left. Will make on a regular basis. Thank you! I just made this fried rice and added some shrimp to it…yummy. Love the adamame in it. I just made this tonight and my husband was impressed just looking at the dish. He really enjoyed it, especially the edamame. I added some sesame oil to give some added flavor, plus I love sesame. I'm sure toasting some peanuts and adding that would also make it excellent, but extra calories if you're trying to keep them low. But otherwise, great! I just made this fried rice with Gina's Asian Glazed Drumsticks and it was a delicious meal! I basically followed this recipe to the letter, with the exception of cooking the veggies in a mixture of sesame oil and canola oil and I added some sriracha hot sauce with the soy sauce to give it a little more flavor. I would definitely make this again, but I don't have to for awhile since I'm only cooking for one and it makes so much! The one-cup serving size was more than enough alongside the drumsticks and some steamed broccoli. Can't wait for the leftovers! Made this last night! Used a bit of sesame oil with veggies, added chicken to make it a meal, and topped with sriracha for the extra spicy kick. Delicious leftovers for lunch today! Yum Yum Yum! Loved it. I would add some fresh ginger when stir frying the garlic and veggies, and agree that adding a smidge of sesame oil at the end–even if you have to subtract a little of the oil used for stir frying–would make a big difference. Thumbs up from both my 1 and 3 year olds!!! Thank you!!! Made this tonight and added some left over shredded chicken I had on hand to bulk it up. Will likely go crazy adding veggies for the next round, but it was great! Thanks again! I made this for dinner last night and it was even better than I expected. Thanks for the recipe…it was delicious! Made this last night with the Asian Flank Steak skewers – my husband raved on and on about both dishes! This is now my go to recipe when we're craving Chinese take-out! Fantastic! This was amazing!!! Thank you for the recipe! This was awesome. We might not ever order restaurant fried rice again! We added some extra soy sauce at the table, but otherwise, it was VERY good. We'll be adding this to our list of regulars! Really enjoy your recipes, Gina! And, I echo the comments I've seen by others – you're making it MUCH easier to follow WW, and the whole family now has a much healthier lifestyle! This rocked! Easy and quick with frozen brown rice (Trader Joe's has it) – spiced it up with chili sauce, and added some shredded cabbage and orange peppers I had on hand. Light dinner, but perfect for lunch! Made this last night for dinner and it turned out SO good! Very easy to make and quite tasty! Thanks for the great recipe – I love your blog! It would be good to add a tiny bit of toasted sesame oil at the end. It would be worth the few extra calories for the flavor punch it adds. I made this today and it was super easy! Was yummy but kind of bland for my liking, I ended up adding lots of soy sauce & salt and pepper. Probably ruined the 'skinny' part of it though! oh well! can't wait to eat the leftovers! This was really good and super easy. I love veggies so I added more carrots and scallions. This would also be great with peas if you don't have soybeans! Made this to have for lunches for the week – didn't last for more than two days! Got requests for the recipe from my husband's co-workers ( I am always directing thence to your site)! I made this tonight!! It was absolutely amazing!! I looked all around my supermarket this morning and could find any edamame, so instead I had a leftover baked chicken breast from the couple nights back, that I cut up and added to it! It was perfect. I would also like to add, since I've been using your website, my grocery bill has been lowered by half, and I myself have lost 15 pounds! That is wonderful. I was just perusing the site and you comment made me very excited to start cooking from here! I made this for my family last night and added shrimp. The devoured it. It was a huge success. Thank you so much for your recipes. I made this tonight with your Asian grilled chicken. Both were very delicious! I did need to add some more oil and seasoning to mine, though. Just to moisten and flavor the rice. My onion wasn't very pungent, though, so the lack of flavor could be my issue. This looks so delicious! I've put edamame on my shopping list and can't wait to try it out! I made this tonight with shrimp, delicious. I love your recipes, the fabulous photos, fresh ingrediants, simplicity and fun. You are the only person who has ever gotten me excited about cooking and eating well (30 lbs lost since January). Thank you for all your hard work. I love fried rice but haven't mustered up the courage to make it at home yet because it has always scared me for some reason. Probably because I work with a Chinese woman who makes the best I've ever had. But I might have to try this anyway! I made this last night and it was great! Very healthy and filling. I added a bit more soy sauce and probably less oil (used a misto so I'm not exactly sure how much). why do you cook the egg first? i thought the purpose of adding egg to fried rice was to keep things together, and that it was added at the end to bind the different parts together? I made this last night – used celery as well. It was DELICIOUS! Thank you! I love using Edamame as snack…I like to buy it in the pods, roast with a little salt and minimal oil…I like the pods because it takes a little longer to eat them! I will definitely try this recipe. We LOVE your Asian turkey meatballs, and this was a yummy side to go with them tonight! Very filling, lots of protein, and so good! I opted to cook the veggies/rice in coconut oil in the wok and it added a hint of additional deliciousness 🙂 Will be making this again! Gina, I make something very similar all the time for dinner. I recommend your site to everyone who will listen. (In fact, tonight we had the Turkey Zucchini Burgers. I love the leftovers crumbled in salad.) Oh my word, you have a God given talent…thanks for sharing it with us! My kids love edamame! Trader Joe's has soy -catash with soy beans instead of lima beans! All I had to say was that's edamame and they ate it right up! This looks AMAZING! I just discovered edamame's and Ive got to make this!! My tummy just growled when I read this recipe! 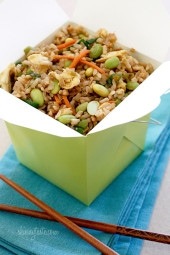 I love the idea of edamame in fried rice. Yummy! Planning on making this tomorrow with your Asian Turkey Meatballs. So happy I stumbled upon your site!!! I've even got my husband and daughter hooked on it! No one ever thinks they're eating healthier!!! It's Passover so we can't eat rice. I made this with quinoa and it was a huge hit. Love your recipes. What a wonderful rice dish! I love making fried rice at home, it makes me feel good because it's half the calories and I can put whatever veggies in it I please! If you don't have a wok, a large pan would work fine! I've never used a wok. Can I use one on top of my gas stove? Can you do it in a regular pan or do you have to have a wok? Absolutely- I have done it both ways. If I am cooking with meat (beef,chicken, pork etc..) the wok is a better choice for me, but for just the rice, a regular pan works better. Yum, we always use edamame in our fried rice, since I have pea disliker in the house and it is delicious. On a side note, I make spanish rice with carrots and corn to get around the pea issue there also. 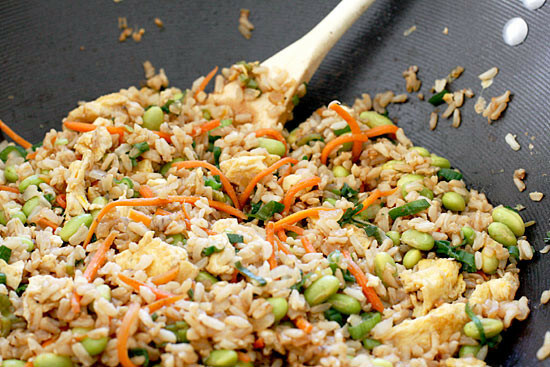 I have wanted to cook more with edamame and this fried rice looks like a great place to start! Sounds wonderful. I love all your recipes always tasty 🙂 The addition of edamame is a great idea. I have been using Edamame in place of so many veggies lately. I love it. I made Indian Butter Chicken & used edamame instead of peas. Love It! Will try this one Thursday. You can also leave the egg out all together and make it vegan. Add a little 'black salt' if you want to add the egg taste. Just a little goes a long way. I made this tonight in a regular pan and it was delicious! Looks awesome for vegetarian and quick lunches! Thanks!